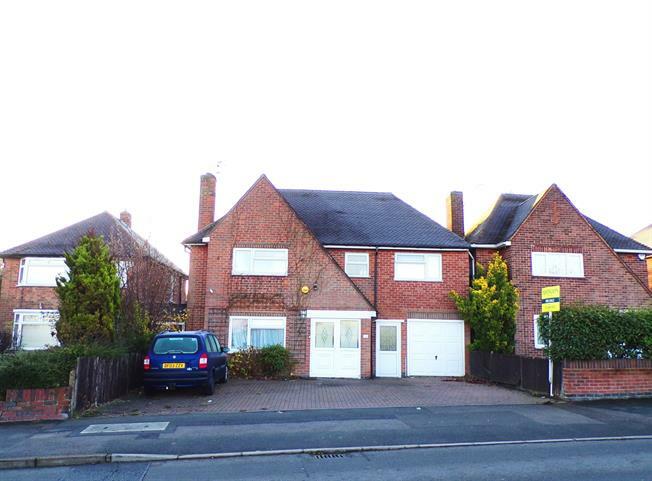 4 Bedroom Detached House For Sale in Wigston for Offers Over £300,000. Spacious detached family home in a popular location. This tastefully extended family home offers spacious and versatile accommodation over two floors, which comprises of porch, entrance hall, spacious lounge diner, conservatory, breakfast kitchen, utility room, four bedrooms, ensuite and family bathroom, enclosed rear gardens, side lobby, single garage and ample parking to the front oif the property. UPVC double glazed door. Double glazed uPVC window facing the side. UPVC double glazed door. Double glazed uPVC window facing the side. Radiator, vinyl flooring. UPVC sliding double glazed door. Radiator and gas fire. Double glazed uPVC window facing the rear overlooking the garden. Radiator, tiled flooring, under stair storage. Roll top work surface, wall and base units, stainless steel sink, integrated oven, gas hob, overhead extractor. Double glazed uPVC window facing the rear overlooking the garden. Roll top work surface, base units. Double glazed uPVC window with obscure glass facing the front. Radiator, vinyl flooring. Low level WC, single enclosure shower, wash hand basin. Double glazed uPVC window with obscure glass facing the rear. Radiator, vinyl flooring, built-in storage cupboard. Low level WC, panelled bath, electric shower, wash hand basin. To the front of the property is a block paved driveway providing parking for several vehicles, door to side lobby, single garage with up and over door power and lighting. To the rear is a good size garden which is mainly laid to lawn. Paved patio area, raised beds filled with plants and shrubs, mature and established trees.